With the recent restoration of the traditional altar arrangement of six altar candlesticks and central altar cross in the Vatican Basilica, it would seem like an auspicious time to speak about a book, edited by Fr. 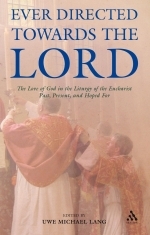 Uwe Michael Lang, aptly titled Ever Directed Towards the Lord: The Love of God in the Liturgy of the Eucharist Past, Present and Hoped For. The book is a compilation of essays that were presented as papers in a Catholic liturgical conference in the university town of Oxford in the Autumn of 2005. The conference was sponsored by the Society of St. Catherine Siena, an English Catholic society that pursues theological and liturgical research, and which has recently come into the spotlight for its sponsoring of an important liturgical study which will analyze and compare the pre and post-conciliar collects of the Roman Missal. Many of the contributors found in the volume form a part of the “who's who list” of those working within the context of Benedict's “new liturgical movement” -- a movement which seeks to promote the sacred liturgy in continuity with the liturgical tradition of the Church. Contributors in the volume include Professor Eamon Duffy, Dr. Laurence Hemming, Fr. Jonathan Robinson, Fr. Uwe Michael Lang, Dr. Lauren Pristas, Dr. Susan Parsons and Paul Bradshaw. The papers themselves cover a range of topics which promises to offer something to most everyone. While each essay brings its own unique and important considerations, for the purpose of this review, we will focus upon Professor Eamon Duffy's essay, The New Pope and the Liturgy and the essay of Fr. Jonathan Robinson, The Mass and Modernity in order to give you a sense of the book. ”Joseph Ratzinger is both more theologically sophisticated than his predecessor, and a good deal less religiously adventurous. John Paul II was a stout defender of tradition, yet he was untroubled by post-conciliar liturgical discontinuities which so disturb his successor, and he thought nothing of drastically recasting two of the most precious devotional treasures of the Catholic Church..."
Duffy here refers to the Rosary and Stations of the Cross of course, which John Paul II made revisions to. In this light, Duffy is quite correct to note that Benedict differs quite a bit from his predecessor insofar as he seems far more inclined to view himself as a steward and teacher of the tradition -- something he set out at the beginning of his pontificate. Of course, this does not make Benedict devoid of his own adventuresome spirit, which can be seen expressed in his willingness to go contrary to the liturgical establishment of the past decades in his work to re-orient the liturgy back toward that tradition. In speaking of Benedict's approach to the liturgy, Duffy notes that the present pontiff is not for excessive business within the Mass, nor does he take stock in the idea that the liturgy must be instantly accessible; he further takes a position against any sort of theatricalization of the liturgy, as well as against improvisation and spontaneity. For Benedict, Duffy argues, these subvert the essence of the Mass, dumb it down, and contradict the liturgy's universal character. By presenting the history and meat of Benedict's thought as it relates not only to theological principle but also historical situation, readers will no doubt walk away with a greater understanding and appreciation of Benedict's program of liturgical reform – as seen in the aforementioned changes upon the papal altar as well as in Summorum Pontificum. Further to that, it should also help readers to better understand our present liturgical context and take a more nuanced view of the liturgical movement itself. The crux of the matter for Robinson is that ideas and principles do matter and the ideas and principles of modernity can often be found to be in opposition to Catholic principles and come at the precise expense of them. This is a point that must be recognized and analyzed if we are to understand our present liturgical situation, including why the situation of liturgical malaise we find ourselves in today exists. Liturgically, Robinson proposes that whatever our struggles to determine how to bring the message of the Gospel to a culture whose principles are often radically inimical to it, we must re-orient our worship clearly back to God for the sake of Catholicism itself. He considers a few areas for liturgical reform. Restoring ad orientem is desireable for a variety of reasons, not the least of which that the versus populum posture teaches the wrong lessons about the relationship between God, the priest and the Christian community. Second, the wide range of textual options and the ability of the priest to ad-lib within the modern Roman liturgy de-objectivizes the liturgy which further relates to a general lack of objectivity found within the culture itself. Drastically reducing or even suppressing such options so as to ensure that the Roman liturgy is recognizably the same wherever it is said will assist in a greater respect for the objectivity of the liturgy and objective truth itself and will better serve the needs of the community. These and other such insights and proposals fill this paper – which also serves as a good introduction to Robinson's even more vigorous and thorough consideration of the same issues in his book, titled by the same name as his paper. This brief overview of some of the main themes found in the aforementioned two essays will hopefully give potential readers a sense of the depth and approach of the volume generally. We have seen before volumes which have gathered together papers delivered at liturgical conferences, including another Oxford conference published by T&T Clark, Beyond the Prosaic, and this title takes its rightful place alongside these as a substantial and qualitative volume. It is a book to be highly recommended. If there is a point of critique, it is simply with its pricing. While institutions will most certainly find this title a must-have for their liturgical collections, individuals may be tempted to leave the title aside for that reason. However, despite its expensive price tag, I would recommend that you consider putting out the money for the title, not only for reason of the quality and relevance of the contents, but also for the reason of supporting the work of conferences such as these and their participants and encouraging further publishing of such research which can only be of benefit for the furtherance of Benedict's new liturgical movement.